In this installment of the Forever Finley Short Story Cycle we return to characters we met in Come December. Natalie and Damien are now engaged. Natalie's family and friends are less than happy with Natalie for becoming engaged to Damien after only 4 months. When Natalie starts hearing the warning of, "Mayday Mayday Mayday" within her mind she begins to question her decision as well. Is the warning coming from George? Is he warning her that she is about to make the worst mistake of her life? Once again I enjoyed returning to the town of Finley! The bonus is getting a glimpse of what is happening with characters we have already met in the cycle. I love the legend of George visiting "those in need." There is definitely something magical about the town of Finley! I think it would be the perfect place to settle down in. Looking forward to the next installment! 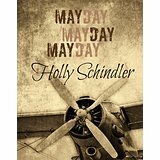 Mayday Mayday Mayday is the 6th installment in the cycle. Each short story can stand alone, or you can start from the beginning with Come December.